The stabilisation of deep landslides is still a challenge for geotechnical engineers, mainly due to the high cost of structural control works that generally lead engineers to opt for drain systems. Unfortunately there are operative difficulties affecting excavation of deep drain trenches in soils dislocated by landslides (especially as regards the provisional support of the excavation walls). Small- and medium-diameter wells are a valid alternative in deep landslides, being less expensive than large-diameter wells equipped with horizontal pipes and simpler to construct than deep trenches. However, no technical procedures for their proper design are reported in the literature: design criteria commonly used in practice are derived from pumping problems and are largely inadequate, being based on Dupuit’s hypothesis that presumes stream lines to be horizontal. 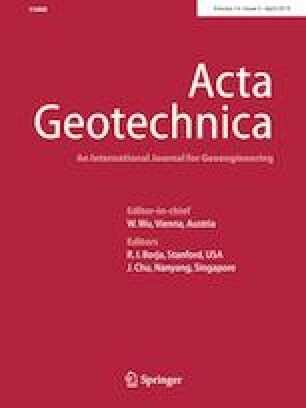 This paper presents numerical solutions obtained from three-dimensional seepage and consolidation analyses of a slope drained by small- and medium-diameter wells, arranged according to various positions, showing that the efficiency of the well system decreases as the depth of the landslide slip surface increases. Comparison is also made between well systems and deep trenches occupying the same draining volume in the landslide body, showing that the former attains much greater efficiency than the latter. Non-dimensional abaci for the square grid of wells (which is the most effective arrangement) are reported herein to be used for practical purposes.